“How do sled dogs know where to go?” This simple question has been asked often in my classroom this year as my students learn more and more about the Iditarod. Mushers and their teams have a very special and trusting relationship, but how do they communicate on the trail with each other? For help I turned to 2016 rookie Iditarod musher, Dr. Larry Daugherty. Larry is living his childhood dream of leading a dog team to Nome in the Last Great Race on Earth®. His grandparents were global adventure seekers which inspired him early in his life to one day mush in the Iditarod. He is now a respected doctor at the Alaska Cancer Treatment Center in Anchorage, bringing the same loving care to his dog team as he does to his patients. I met Dr. Daugherty this June at the Summer Camp for Teachers, when he signed up to be a musher at the volunteer picnic. He is an Iditarod rookie…just like me! His enthusiasm and positive attitude are contagious! Larry is under the tutelage of veteran Iditarod champion Mitch Seavey this year. Larry took some time on the trails of Willow, Alaska to show us how unique verbal commands help a musher and sled dogs communicate and work together throughout the race. As Larry explains in his video, sled dogs understand when to turn left or right, stop, and go, with special words from their musher. 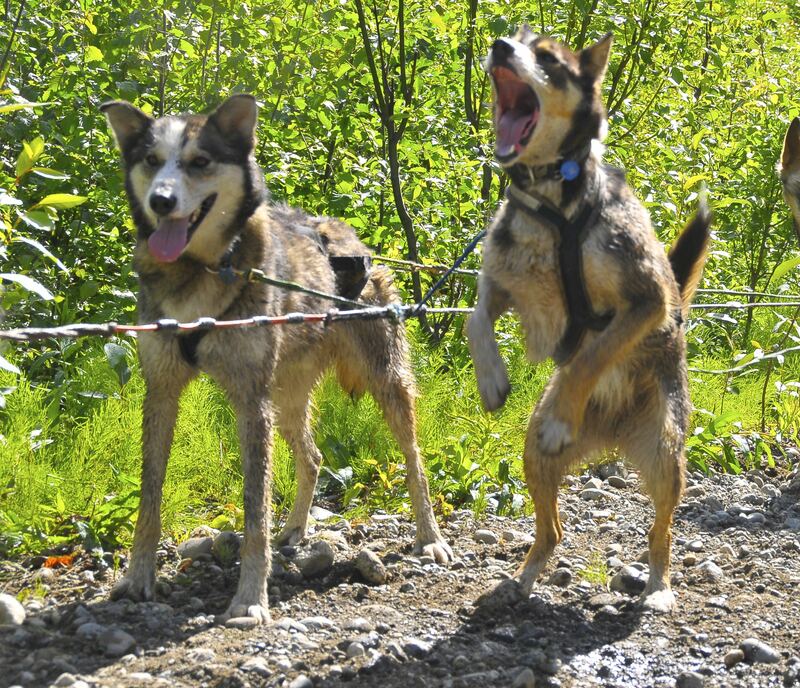 There are a few basic mushing commands that help guide sled dogs and let them know what to do. He began the video by telling his team “Whoa!” which means to slow down and come to a halt. His dogs understood just what to do! When he said “Hike!”, they started trotting up the trail. He helped guide his team on the Willow trails with “Gee!”, which is the command for a right turn and “Haw!”, the command for a left turn. There are times on the trail where there may be several paths to take. What does a sled team do? 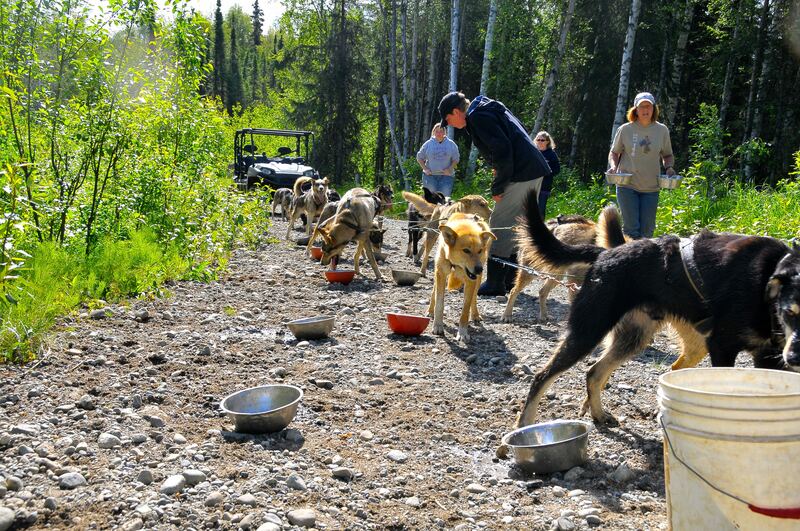 When a dog team is well trained, they listen and follow the correct command from their musher to guide them the correct way, so they won’t make a wrong turn. It truly is teamwork at its best. Larry also does a wonderful job of showing how even the pacing of the dogs is watched carefully by the musher to ensure the team moves along the trail safely. In the warmup, students shuffled to the right when the teachers yelled, “Gee!”. They shuffled to the left when they heard, “Haw!”. When the teachers gave the command “Whoa!”, they made a deep lunge to the floor, and when they heard “Hike!”, they jumped up and ran in place. This was a fantastic warmup, and soon the students had their hearts racing and were ready for some real sled dog racing with scooters and mats! A Texas sled dog team! For “The Main Event” lesson, an obstacle course was set up in the gym using numbered cones to represent checkpoints on the Iditarod Trail. Mrs. Michael first reviewed the mushing commands they had seen in the video from Dr. Daugherty and discussed the rules for our Iditarod lesson before the fun started. For this PE activity, students were also expected to use responsible social behavior and sportsmanship towards their teams. Small scooters were placed under large mats and 3 students at a time created a dog team. 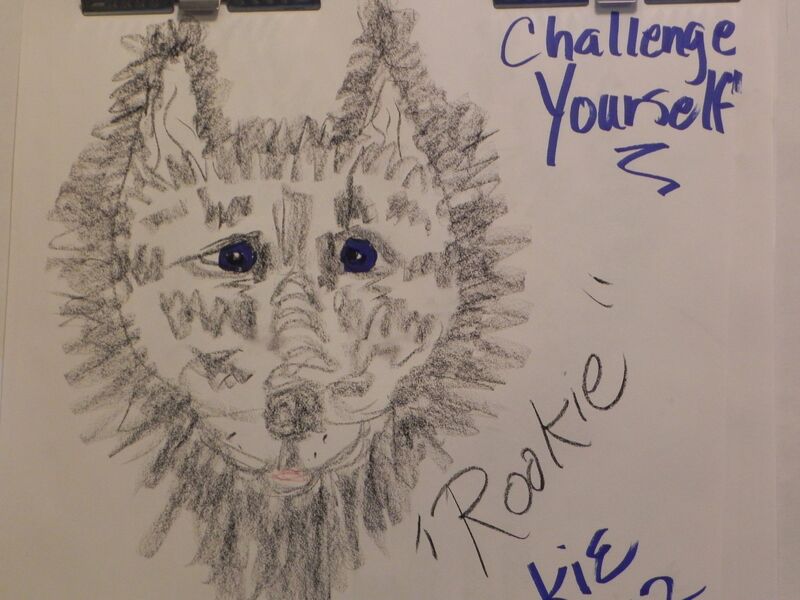 A “lead dog” pulled the “sled” with ropes, the “musher” yelled the commands around the course, and a student in the back helped guide the “sled” to Nome. This was especially helpful as many sleds took a spill on the trail! Dr. Daugherty took some time on the beautiful Willow trail recently to introduce us to some of the members of his dog team. You can tell they are ready and excited for the Iditarod! Larry is living his dream with the support of his wonderful family including his wife, Prairie, and and his five children: Bailey, 15, Calvin, 13, Azalea, 9, Conrad, 6, and Charlie, 4. He loves inspiring children, and he is a big supporter of the Teacher on the Trail™ program, his Boy Scout Troop 29, and the organization Radiating Hope improving cancer care around the globe. He believes that “Success is possible through hard work, dedication and perseverance.” I hope to see Larry and his team under the burled arch in Nome this March. I know his family, friends, and his patients will be cheering him on the whole way there! Our PE teachers, Stephen Presley and Jeannette Michael, were inspired by musher Larry Daugherty, and they created these lessons for the students at Eanes Elementary School. Our students had a great time, learned a lot, and we hope you can share this activity with your school too! Want to know more about Larry Daugherty and other 2016 Iditarod mushers and their teams? The name says it all. The ULTIMATE INSIDER gets access to everything! All of the benefits of the INSIDER VIDEO combined with the ability to “Track the Pack” with the GPS INSIDER! Access to all of the commercial-free video. Spotlight up to 5 of your favorite mushers and receive email alerts when they enter and leave a checkpoint. What qualities do you feel an Iditarod musher displays? My students recently came up with a lengthy list of qualities that they felt described an Iditarod musher. There are plenty of them and they’re unique. 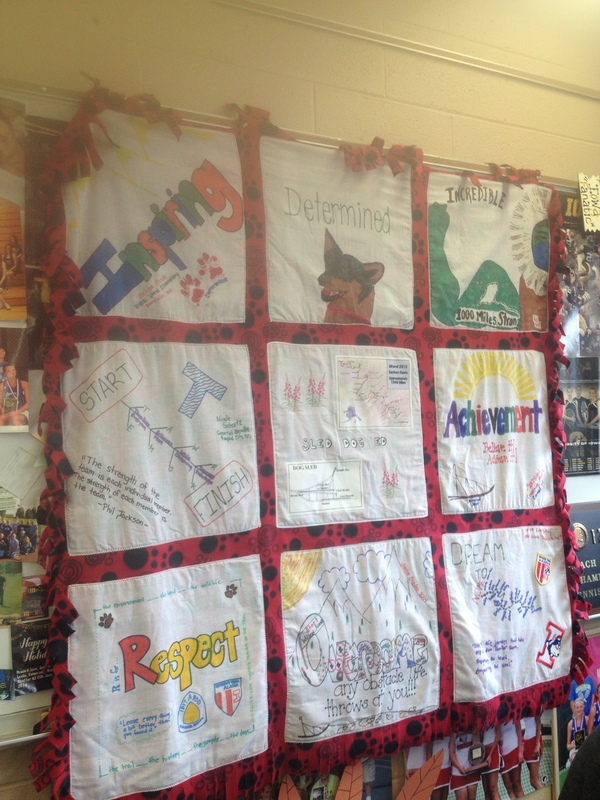 My school currently has the most recently created Iditarod Traveling Quilt, which was designed this summer by teachers at the Iditarod Summer Teacher’s Camp. I wrote a post about our squares earlier this summer, The Incredible Quilt. Terrie Hanke, 2006 Iditarod Teacher on the Trail™, took the squares which were drawn on white handkerchiefs and sewed them onto a piece of fleece making a colorful quilt. Having the Traveling Quilt in your classroom is the perfect opportunity to do several lessons with your students. One lesson I did with my class was on character qualities, or character traits. To start the lesson I shared the quilt with the students. Since I was at summer camp, this quilt is personal to me. I designed a square and heard ideas from the other campers as they created their squares. I shared the meaning behind each square with my classes. We discussed the qualities shown on the quilt squares and how each symbolized Iditarod mushers. Teachers at summer camp chose Inspiring, Determined, Incredible, Teamwork, Achievement, Respect, Overcome and Dream as the character traits for the squares they created. We read a story from Lew Freedman’s Iditarod Classics. I chose a different story for each group to read. Students took their time and read the thrilling Iditarod accounts. When the students finished reading, they stayed in their groups and brainstormed qualities they felt the musher in their story displayed. We then came back as a whole class and discussed those words and the significance they had in the story. The next step was to assign each group a different letter from the word IDITAROD. The students had to come up with a quality or trait describing the musher from their story using the letter they were assigned. This was a great opportunity to work with students on using a thesaurus. Some students had many words to describe their musher, but no words that started with their letter. Using the thesaurus was very helpful. We are now to the point of designing the quilt square. When we made our quilt squares this summer, we just used white hankies. While I was looking for hankies I found some pre-cut felt squares at Wal-Mart for just 23 cents. The students using their chosen quality designed and decorated the square depicting the story their group read. Much the same as we did at summer camp, when the squares were finished it was time to share with the class. After they shared their story, they shared the quality they chose and why. Finally, they shared their quilt square with the class and the meaning behind the design. Our goal is to have our squares turned into a quilt. This year there are 18 quilts traveling the United States. When an Iditarod Traveling Quilt reaches a participating school, a binder full of ideas for teachers to use in the classroom is included. There is an instruction page on how to actually sew your quilt if your class designs quilt squares. As the quilt travels from school to school around the country, teachers continue to add lesson ideas on how they used the quilt in their classroom. If you are interested in having a quilt visit your school click here. As a post lesson activity we watched Cindy Abbott’s recent TEDx talk. TED talks are conferences that are centered around technology, entertainment, and design. Their slogan is “Ideas worth spreading.” Cindy gave a local talk in California earlier this year. It has recently been posted online. Our class viewed the lesson and discussed the qualities she displays. We then compared these qualities with the qualities chosen for their squares. Check out the video below.